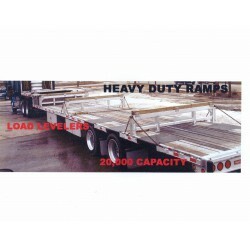 We are an Authorized Dealer for Heavy Duty Ramps and carry in stock the Modular 20”W X 96.5”L X 5”H Load Leveler / Ramp Combination Set Rated at 23,500 lbs. for Step Decks and Flatbeds. 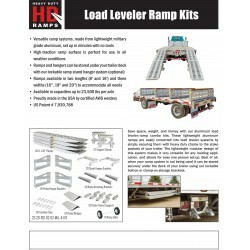 This combination ramp set contains (4) Ramps, (2) Adjustable Stands ((2) Left Hand Stakes (2) Right Hand Stakes (for turning 2 ramps into load levers) (6) Lumber Clips (4) 36”L Aluminum Skid Seats or Optional 36”L Steel Skid Seats (2) Double Right Ramp Hangers (2) Double Left Ramp Hangers (2) Stand Hangers. Custom ramps available for all applications and load ratings.